Fire risk mitigation works are now underway at the Category A Listed Brodick Castle in Arran. This extensive upgrade for the National Trust for Scotland includes major works to form compartmentation, fabric upgrades, fire detection, forming a permanent fire pond, and the installation of a fire fighting, evacuation and access lift, sensitivity incorporated into the historic fabric. 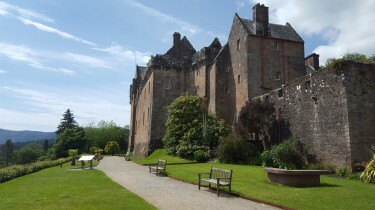 Brodick Castle dates back to the 13th Century and is steeped in history. The Dukes of Hamilton, one of Scotland’s grandest aristocratic families, created much of what can be seen today. The fire mitigation works will help to ensure that this valuable asset is safeguarded for the benefit of future generations.